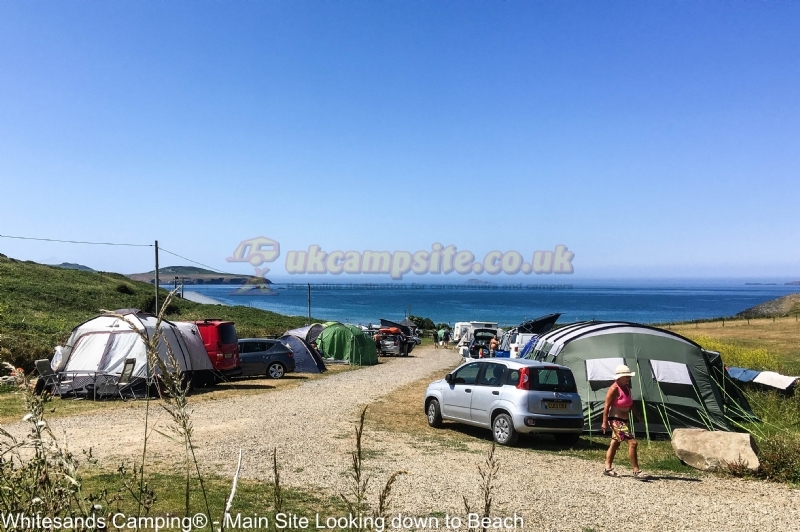 Situated right next to Whitesands Beach, on the most Westerly tip of South Wales, looking out to the Atlantic beyond - you can't get much further away from the hustle and bustle of modern life than this! 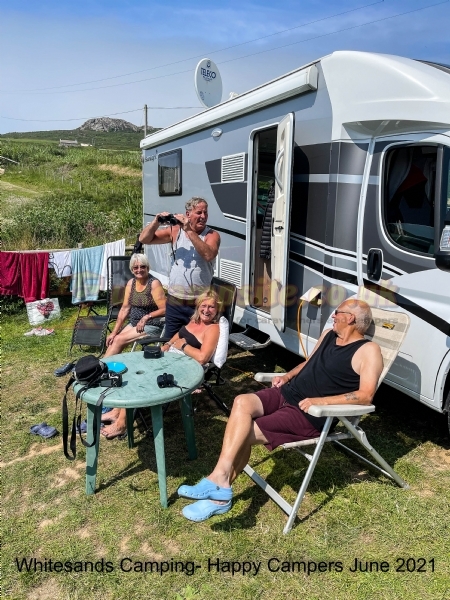 We have catered for campers since the 1930s, adopting a no fuss friendly approach: no need to book or pay in advance, just turn up and ask for "The Famous" Pete, who manages the site, choosing your pitch on the day. 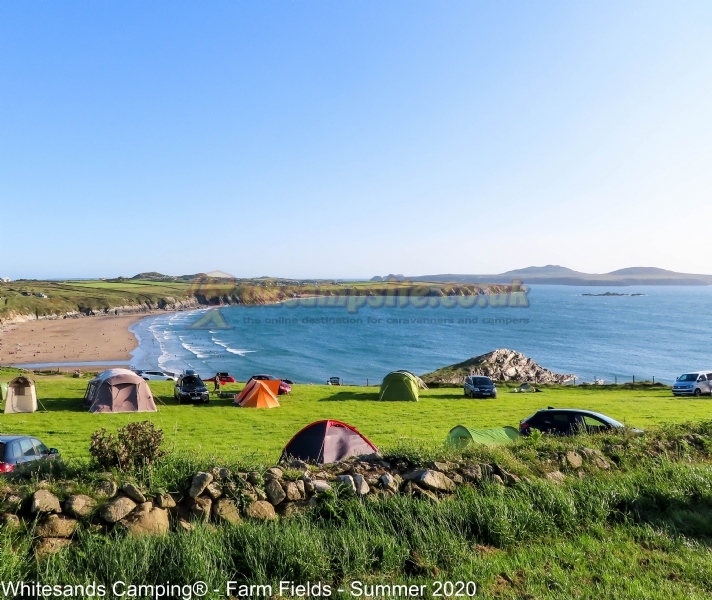 We have 30 tent pitches (no motorhomes, RVs or caravans) available from 25 May 2019 through to 31st October; but in the summer school holiday weeks, during August, the main site expands to include an additional 14 acres (8 football pitches) of rolling fields that provide breathtaking views over Whitesands Bay and Ramsey Island. 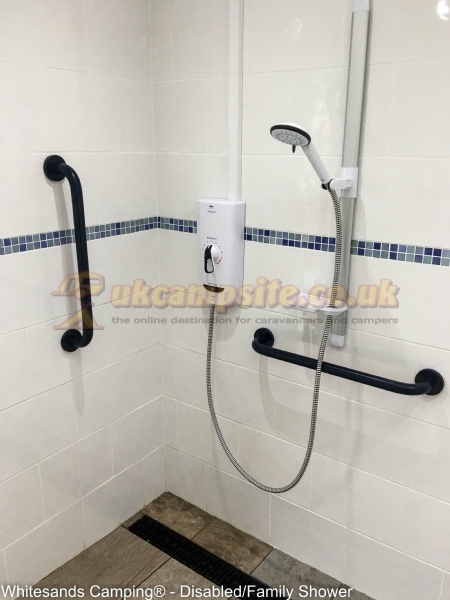 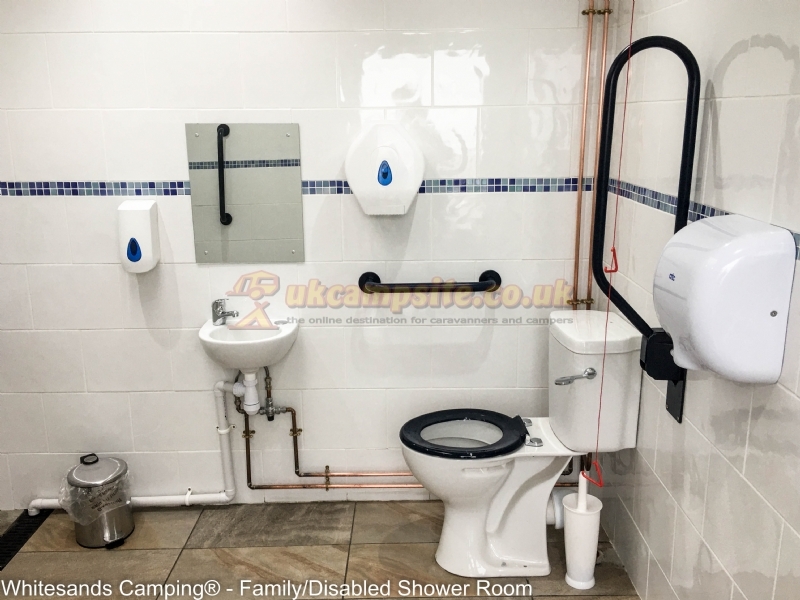 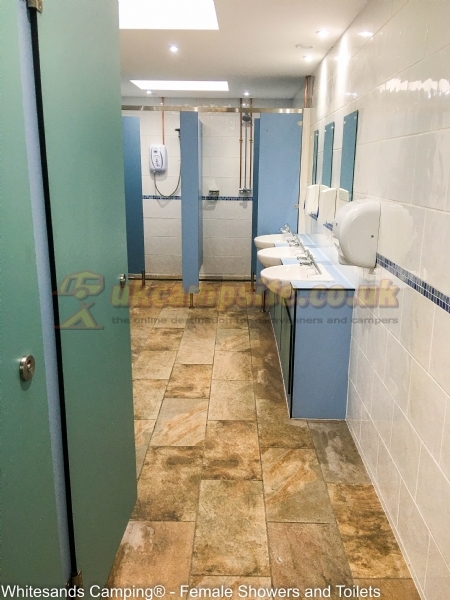 The facilities provided are basic: electric hot showers (two with tokens), outside cold water shower, toilets, an outside sink for the washing-up, fourteen electric hook-ups on the main site ("first come first served", they cannot be booked in advance), and water taps dotted about the place. 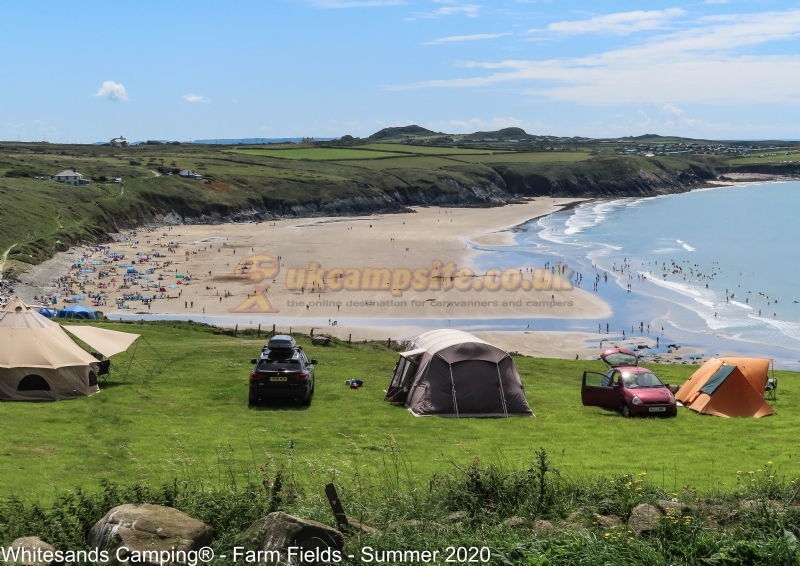 Plus in August there's plenty of room in the fields for a game of football or cricket; at the site you can book surf lessons and hire equipment; windbreaks and recliners can also be rented at the beach car park. 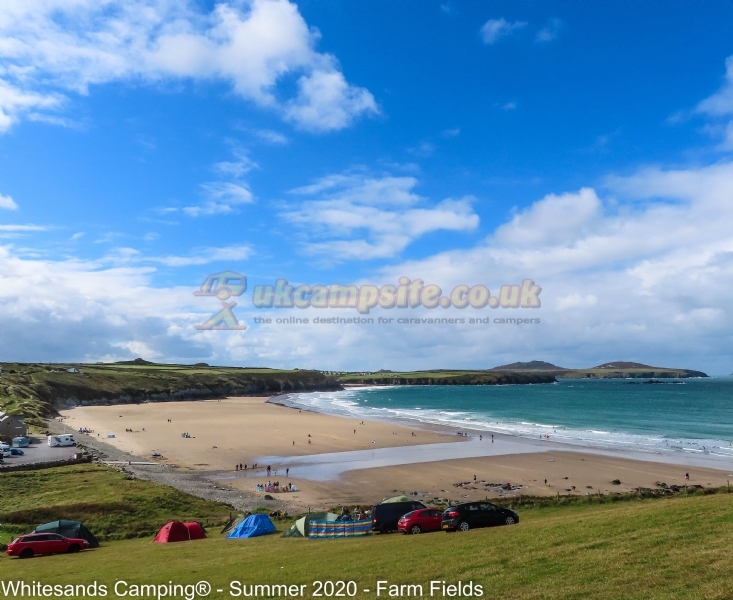 In July 2018 The Sunday Times Travel section chose Whitesands as one of the "top 50 beaches in the UK", and recommended Whitesands Camping as "the best place to stay" to enjoy the beach. 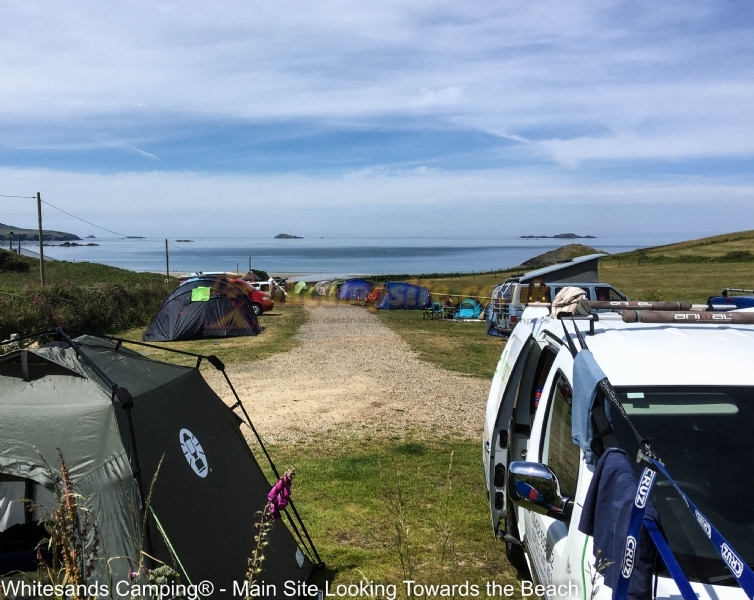 In 2014, this site came top of the Weather Channel's 'Ten Coolest Campsites in Britain': "Whitesands Beach Camp Site is a low-key, no-fuss spot with the best views around and effortless access to the beach. 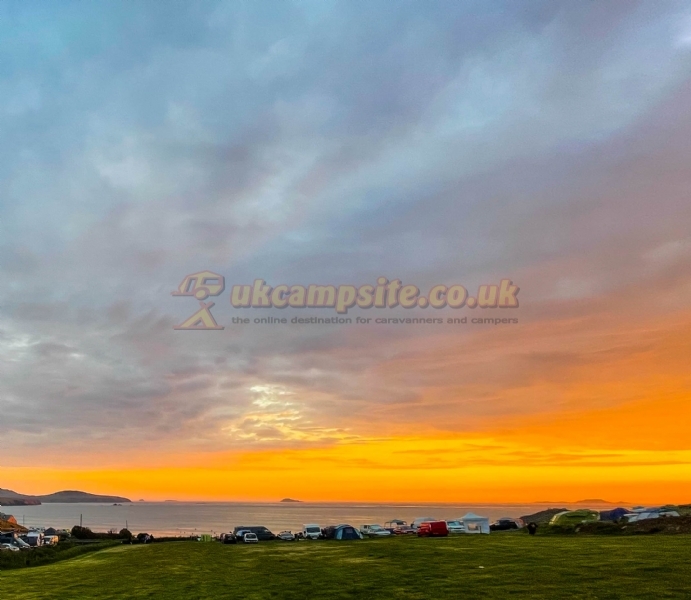 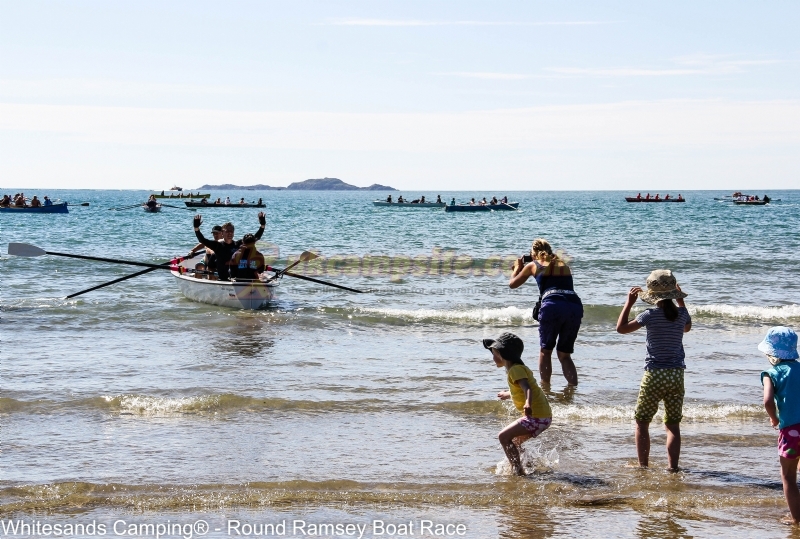 Nights are the real highlight; as the beach empties, campers at Whitesands more or less have their own private patch of sand - perfect for games and BBQs as the sun fades and the moon gradually illuminates the sea". 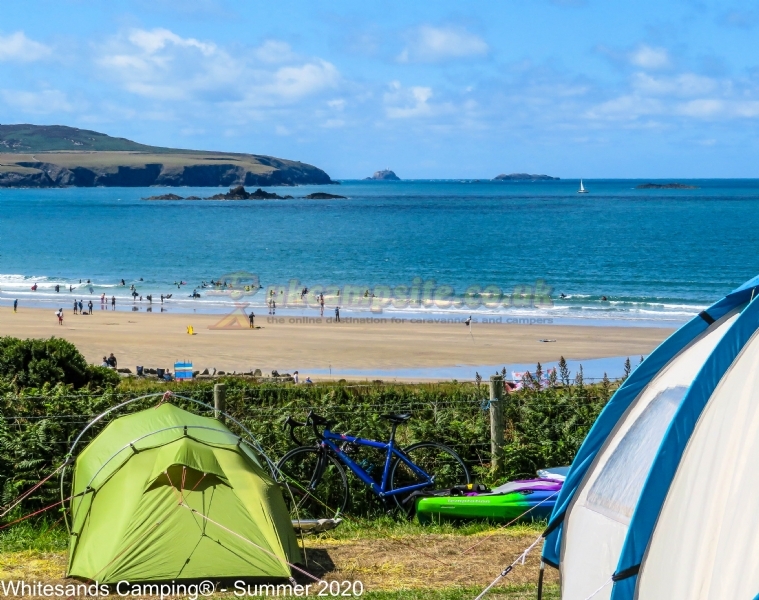 The Beach Cafe is open for most of the year; during the summer months (May to September)the "Coaster" bus travels from next to the site back and fore to St Davids every half hour; and the beach is manned by lifeguards. 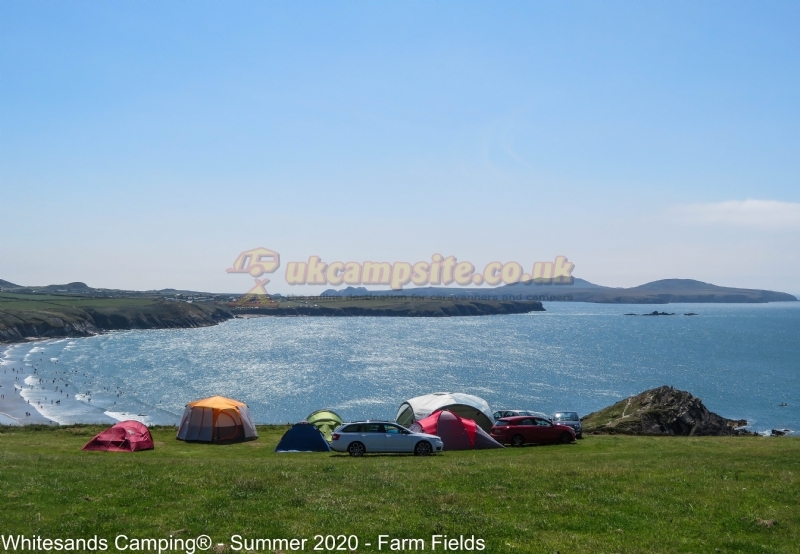 So, if you don't want to drive (and pay £5 in the Whitesands Council carpark), want a relaxed, no-frills tent site with plenty of space, situated next to a stunning beach, with "the best views around" - then this should be your first choice! 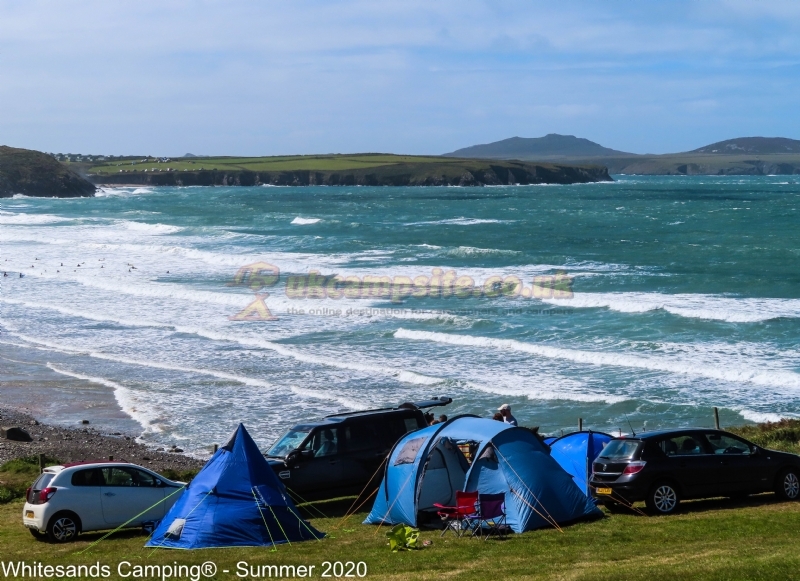 Right next to Whitesands Beach. 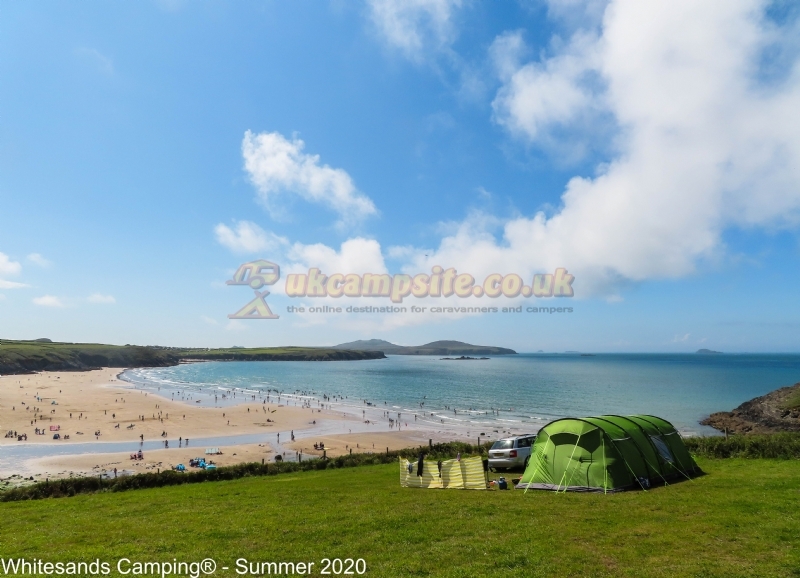 Alongside the famous Pembrokeshire Coast Path. 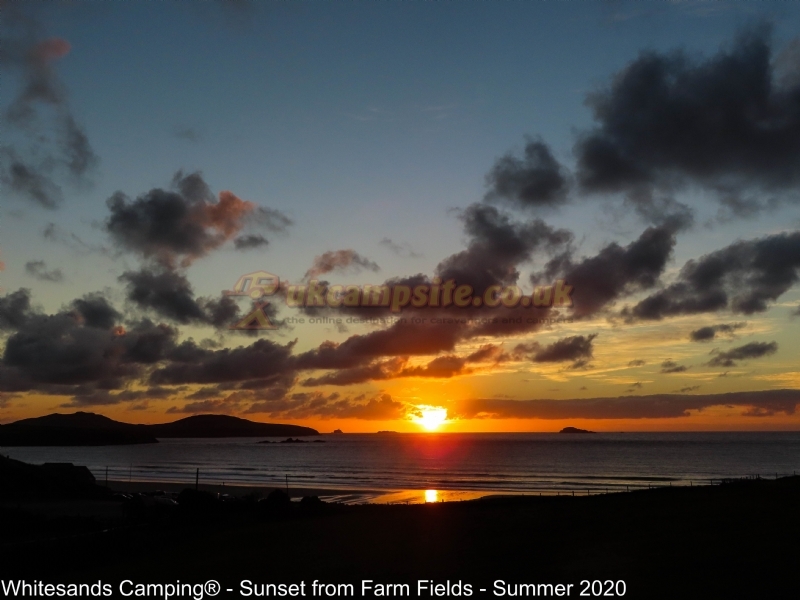 Close to (500 metres) the St Davids links Golf Course (9 hole). 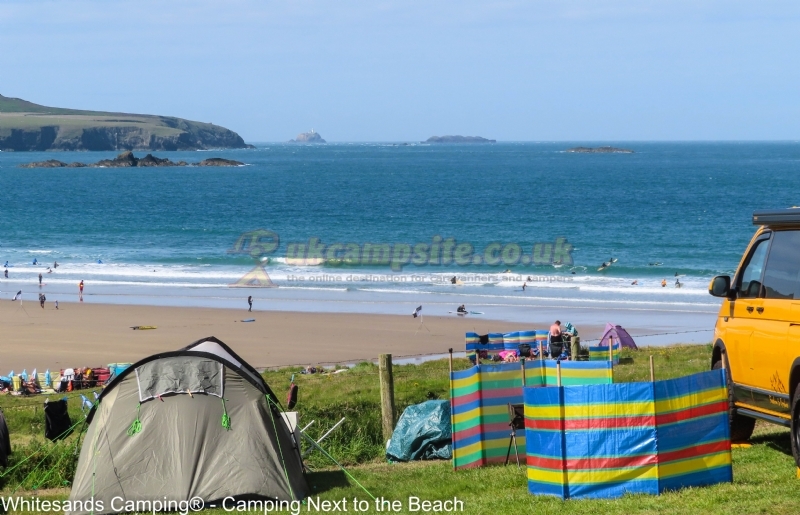 Couple of miles from St Davids (Coaster bus runs half-hourly from beach car park in the summer). 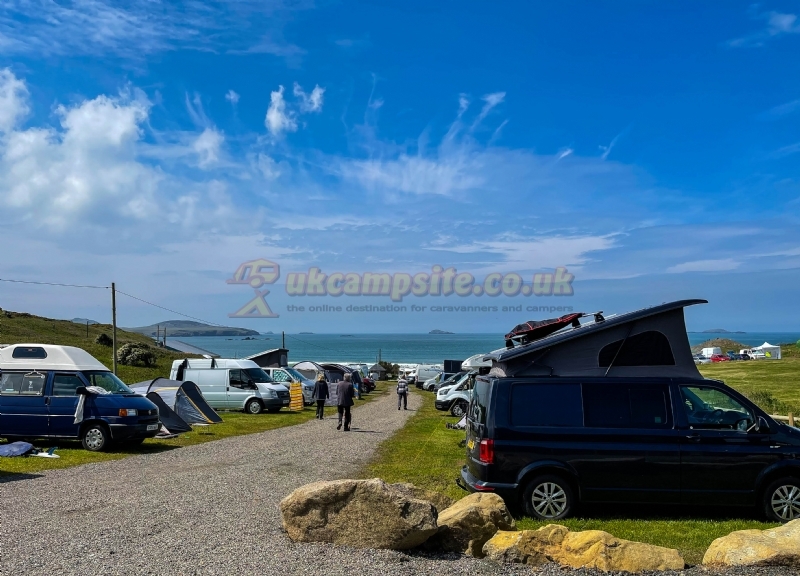 Nearby to (a couple of miles away) the tiny city of St Davids (population less than 2000); here you can visit the Cathedral and Bishops Palace, enjoy a meal in one of the handful of pubs or restaurants, or collect the essentials you may need on site. 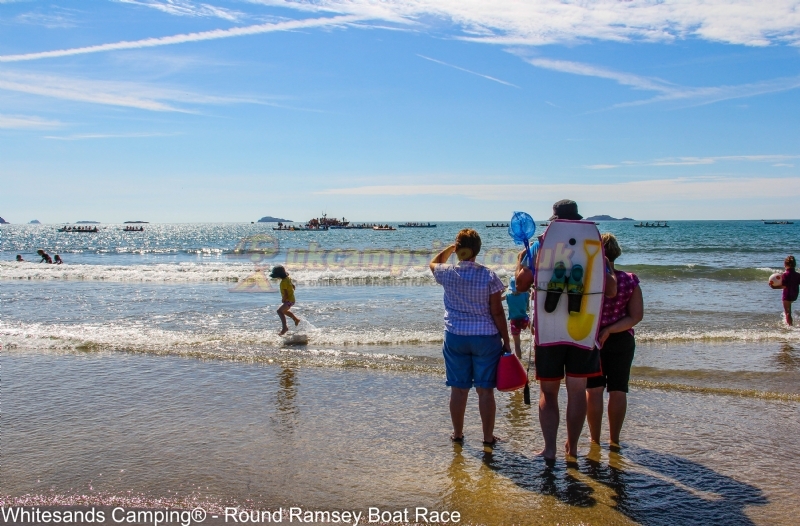 Details: 10% discount given for groups of 20 or more. 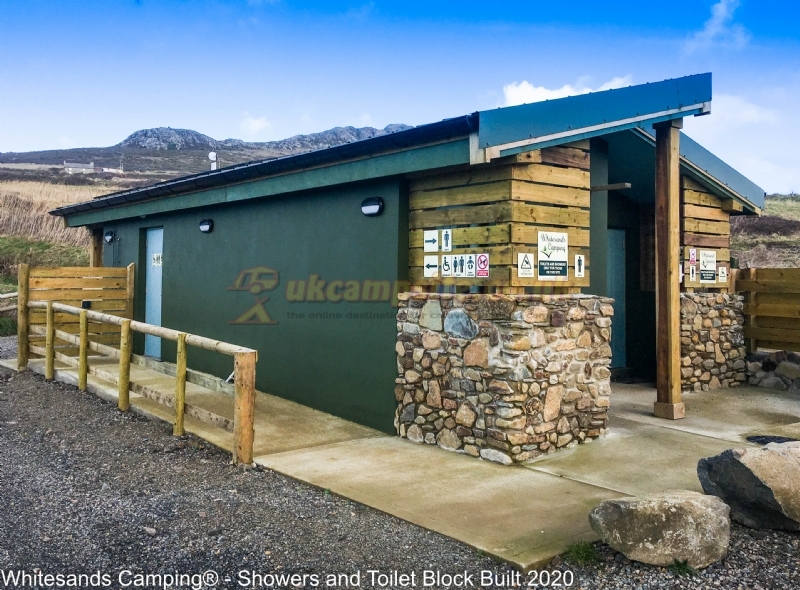 Take the A48 to Carmarthen, followed by the A40 to Haverfordwest and the A487 to St Davids. 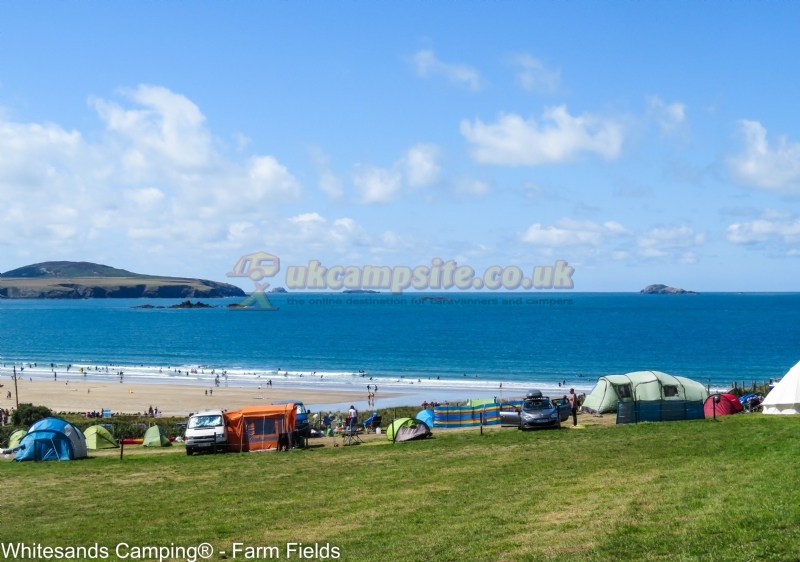 From St Davids, follow signs for Whitesands(B4583, and drive all the way down to the beach - a distance of 2 miles. 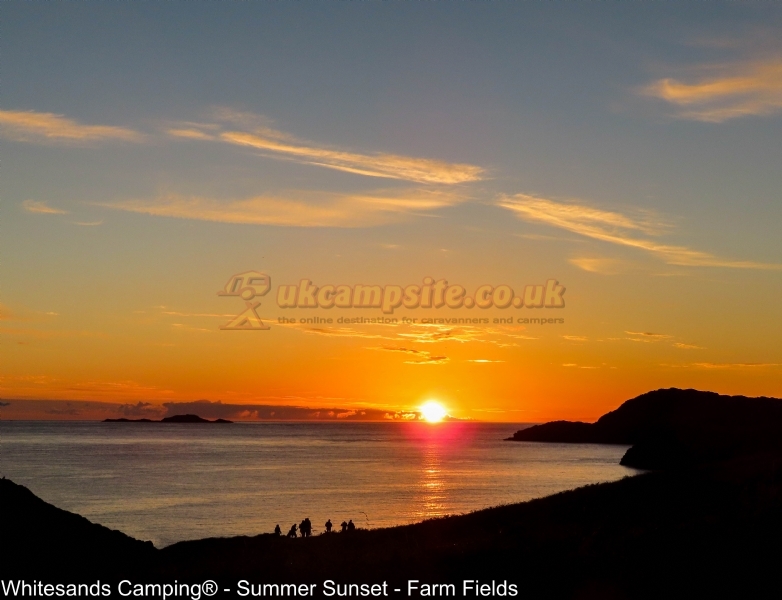 Take the A487 to St Davids. 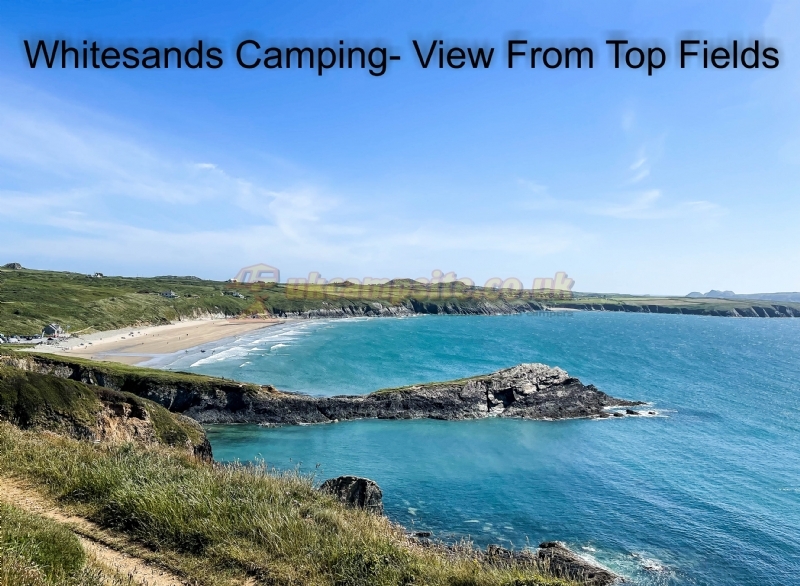 From St Davids, follow signs for Whitesands(B4583, and drive all the way down to the beach - a distance of 2 miles.